Miss Masschusetts Gets In The Game! Today during one of our most competitive games this year for Jim Sokolove's Office, we had a little visit. Team Access had a little surprise in their Cashunt where that added on more person for a team photo...none other than Miss Massachusetts! So we say thank you Miss Massachusetts for being such a great sport and playing along with Cashunt! It has been a couple of months now and Team Leigh Roy has been number 1 for a good part of the season. We have had general games, social games, even corporate games but none of these teams have knocked this team of it's perch. So with that I say congrats Team Leigh Roy you definately deserve the position you are at, now question remains can you become champion? This year will mark our 8th year hosting our very popular Cashunt Haunted Scavenger Hunts. As always the games will be throughout the month of October and promises to give you a wallop of game that will include 6 hunts in one! Bookings will begin starting August 11th for our discounted rates that will go on untill August 31, after that bookings will go back to regular prices. Keep in mind for obvious reasons weekends get sold out rather quickly. Break The Code And Win! Starting on August 10th the cashunt website will host a contest free to the public that will be our new promotion for our Haunted game in October. On the Cashunt Haunted page the public will see a cryptic code, that code will lead you to an envelope that will contain your prize. But first you need the Cryptic Alphabet, there will be a special link to request the cryptic alphabet in order to break the code and win! (starting August 10th) Once a code is figured out and solved we will then put a new code to break, keep your eyes open for that code on the cashunt website in the coming weeks. Good Luck! Gift Certificate Hunt Once Again A Success! Just want to say thank you for those that participated and won in our latest Gift Certificate hunt. We had winners this time around that won gift certificates to Coach, Victoria Secret, Best Buy and AMC, so congrats to all of you. We will be holding another gift certificate hunt this holiday season but pay attention to the next post in regards to our latest Haunted Dash promotion that will be taking place in Salem, Ma! congrats to colleen shaney of natick for solving this week gift cert. riddle! she wins $5o to victoria secret. It's Gift Certificate Duck Hunt Time Once Again ! Remember here are the rules we will give a clue as to where to find our duck that contains a serial number. Once the riddle is solved and the duck has been found email us with the email address that is given and if the numbers match up we will mail you a gift certificate. This is open to the public and once the duck is found, that hunt obviously concludes and another begins. There will be four different gift certificates up for grabs, one each week for four weeks. Good Luck! 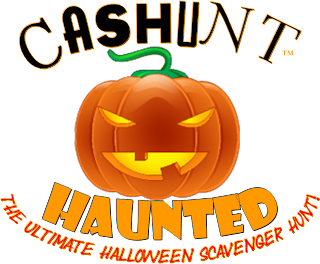 Cashunt's The Haunted Dash Returns To Salem Ma! We are returning to salem, ma this october to start our 9th season of our successful, zany, wacky, and challengeing Halloween multi-game scavenger hunt! This year promises to be the best game we have put together for this version of Haunted, and we are really excited about it. We will be taking bookings for this game starting mid-august, the season will start october 10 thru october 31st. Remember as always weekends are most sought after so if you are interested in this game and want a weekend game please put a temp hold on the date you would like so you will not be left behind. Our games will be held everyday and night but everyone wants the weekends. For more information and details call our offices at 866-276-4733 monday thru friday 10am to 5pm. And yes we can customize the game to fit your group. CASHUNT'S DASH The Ultimate Team Building Scavenger Hunt Now Available in New Major Cities! We are please to announce that our top teambuilding game Cashunt's The Dash Game which boasts a multi-gaming and multi challengeing scavenger hunt is now available in new major cities. This game can be played indoors or out doors or both. The selected new cities are Las Vegas, Chicago, Dallas, Tampa, New York City, Los Angeles. As always the game is always avaialble here in Boston. For more information on this game please call our office at 866-276-4733 and speak to one of our game coordinators. Bridal Dash Spreading It's Wings..
today we are in mohegan sun casino in conn. prepping a wacky mad dash around the casino in and out for our madcap teams. we have twists we have turns we have complete wackiness planned throughout the day. The Ultimate Cashunt Has Returned! First off I want to wish everybody a happy 4th, hope you guys are still grilling out there! A few years ago we had a game called Ultimate Cashunt which was a very challenging game to say the least, also it was very well received. In late 2006 we took it off the market because we thought it needed to be even more challenging or the game should not be called "Ultimate". Well we took this game retooled it, re polished it, and created a monster of a game. We tested it out on 3 different groups in June and the outcome brought smiles to our faces. What we have produced is a 10 game, yes I said that right a 10 game in one scavenger hunt / live board game. To quote a famous saying from one of the biggest band in the world KISS "you want the best ? you got the best! ", we believe we have it. The groups that played this game in June not only have played the regular Cashunt game but they have also played other companies games and the reviews were flattering and fantastic. Ultimate for now will be offered to corporate and some social events. Enjoy the rest of the weekend!